Annapolis Paintings done recently in my studio. From a trip I had taken couple of years ago. I was there with Mica and Ian. We had a great time walking around the waterfront. We also took a Cruise which helped me see and capture panoramic view of the city and its harbor. These new paintings have both- boats and cars! 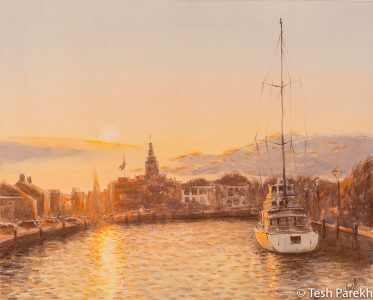 “Annapolis Evening” is watercolor. I may have used bit of opaque white. I wanted to capture colors and energy of the evening so kept the painting loose. I also liked another composition of this same view- I may paint that in the future. Busy traffic on the left side is in contrast to the docked boat on the right side. 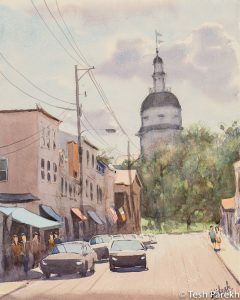 “Maryland Avenue, Annapolis” is watercolor. With State House in the background. The shadows define the early afternoon on the street. 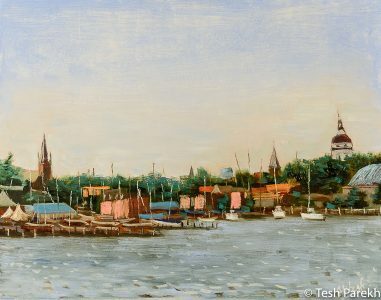 “Annapolis Harbor” is oil on linen panel. I used pre-primed linen and applied couple of additional coats of traditional lead ground. Painted in alla prima manner without use of solvents and mediums. Annapolis Evening. 16×20. Watercolor on paper. Maryland Avenue. 14×11. Watercolor on paper. Annapolis Harbor. 11×14. Oil on panel.